There's nothing quite like sleeping in your own bed. Even though I had a wonderful time away it felt good to wake up this morning to familiar sights and sounds. I arrived home yesterday afternoon feeling truly refreshed, having indulged in a great deal of R&R during the previous week. Bad blogger that I am I neglected to take photos of the many deer that we spied along the roadside or through our cabin window. Nor do I have photos of the fish that I caught (and ate...mmm!) or the loon on her nest or the eagle on its roost; although I had good intentions I forgot to take my camera along every time we went fishing. 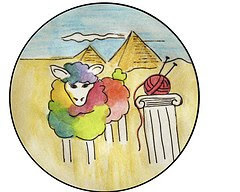 I do, however, have pictures of all the knitting I got done. "Violets Rising" for the May Sockdown on Ravelry. 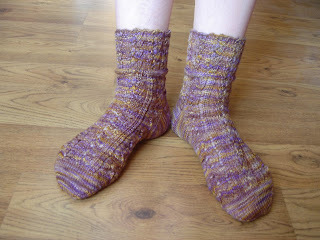 Feather & Fan Socks. I started these way back in March but stalled after working the heel on the first sock. I lost interest after trying (unsuccessfully) to do a contrasting heel in red (my yarn was too heavy) and fiddling with various needle sizes for the foot. Once I picked them up again they only took a couple of days to complete. Berroco Sox for my sister, Jacqueline. I began this pair when I went to Toronto a few weeks ago and took them along to work on in the car on the way up to the cabin. My mom was amazed when she discovered that I continued to work on them even after darkness fell (although we did have to pull over once so I could retrieve a dropped stitch by the car's interior light). 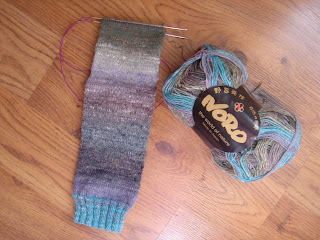 I also began a new pair of socks from Noro Kureyon sock yarn that I bought at the Frolic in Toronto. I'm a bit disappointed with how these are turning out. I chose this yarn based on the colours on the outside of the skein; as you can see, they are rather bright and pretty. However, I am pulling the yarn from the centre of the skein and after the initial turquoise cuff the colours are much more subdued than I'd expected. Since I'm knitting the sock from the top down all the bright colours will be on the foot, hidden away inside my shoe. I'm seriously considering finishing the first sock, then frogging it and reknitting the colours in the reverse order. Hmm, we'll see how much the idea appeals to me once I am done. 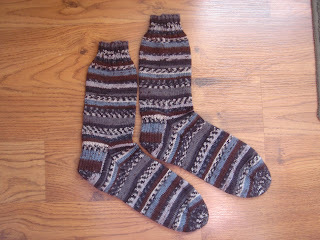 When I wasn't working on socks I did a few more pattern repeats on Muir, which I had roused from hibernation. 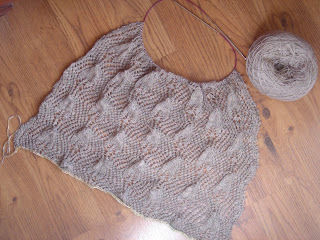 Although the pattern is worked over 32 rows it doesn't require a lot of concentration and is relaxing to knit. After a promising start last weekend the weather turned cool so we spent a lot of time indoors over the following week with the heater humming away, my dad working on crossword puzzles, me listening to my iPod and knitting (Cameron had returned home after the long weekend and my mom spent most of the week at their house in Clinton, ten miles away, busy with the village's Heritage Week activities). We did manage to get out fishing a few times (although we got rained out once) and enjoyed trolling around the lake, watching for wildlife and occasionally reeling in our catch. 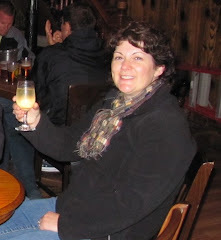 Our peace and quiet came to an abrupt halt Friday night, with the arrival of my sister, her husband, and their four children, who had come up to the cabin to attend Clinton's annual parade and rodeo. Cameron arrived an hour later; although he hadn't intended to return to the cabin (I had planned to catch a ride home with my sister), after a rough week at work he decided "to get the hell out of Dodge" and join us. The rest of the weekend was noisy and busy and fun. I'll write all about it in tomorrow's post--I even remembered to take pictures!